So far I've finished two of three Go Four It Quilt Along patterns in the April issue of American Patchwork and Quilting, I'm still thinking about my fabric options for the third pattern, Scraptacular. To fill the time while I figure out my plan of attack, I played around with the bonus triangles from my Buried Treasure project, and came up with this, my first mini quilt. It finished at 23 1/2" x 23 1/2". The majority of the fabric is from Scrumptious by Bonnie and Camille for Moda. It has approximately 293 pieces. 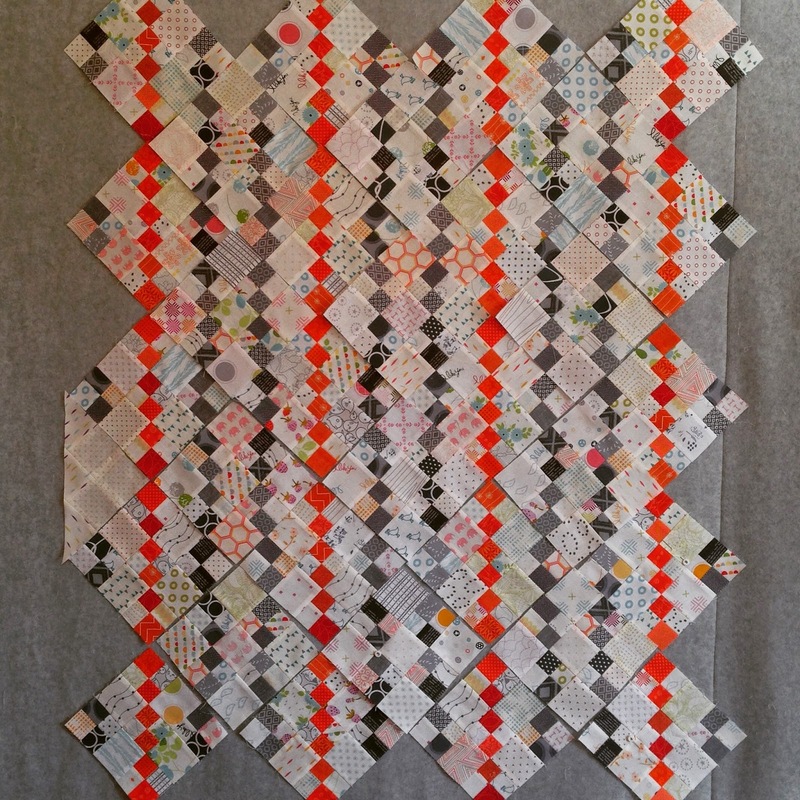 More finished Go Four It quilts are showing up on instagram and around blogland, here's a great finish by Carrie Nelson if you're looking for inspiration. I hope you're Going Four It! I can't believe it's the 15th of the month already. February is over half gone. But besides meaning the month is going too fast, the 15th also means it's time for a new Fat Quarter Shop Snapshots pattern! WOO HOO!! This month's pattern, Block Two, is Sew On & Sew On, my latest favorite. Regardless of the fabric you use, your sewing machine will look great too, the pattern was very easy to follow. Two blocks done, 10 more to go. There are some more quilters working on this project, be sure to check out how they decorated their sewing machines. 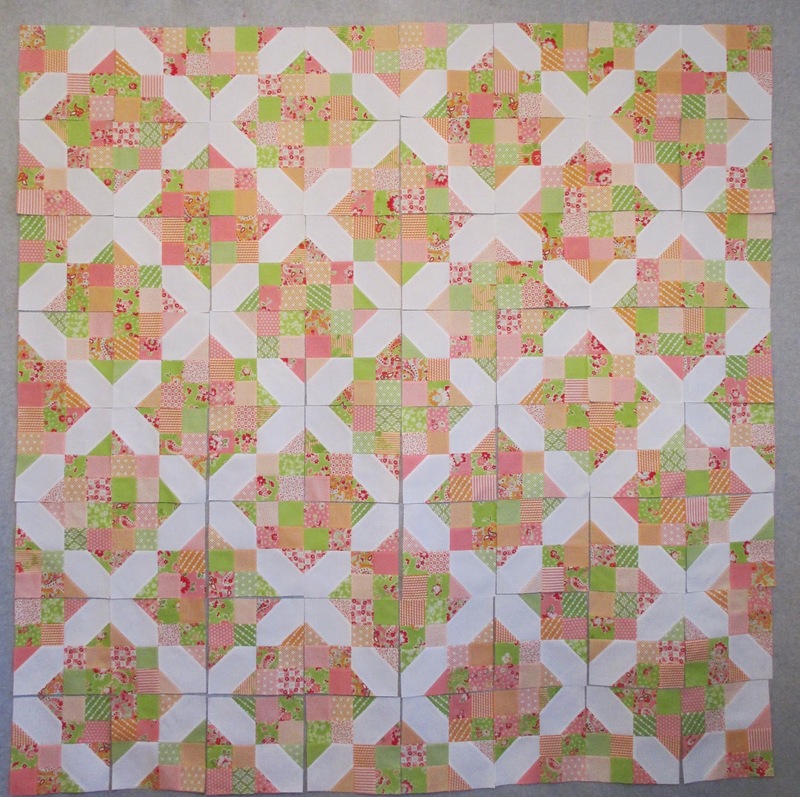 The second pattern I chose for the APQ Go Four It Quilt Along was Buried Treasure by April Rosenthal. Here are my blocks set exactly like the pattern. But you can turn a few blocks here and there and also get this pattern if you prefer. I found working on this pattern pure joy. I love the colors (Scrumptious by Bonnie and Camille for Moda) and learned from my last quilt that I prefer a plain white background. It was easy to piece, all the points and corners matched up perfectly, and it went together in no time. I decided to stick with April's layout. The pattern is Buried Treasure by April Rosenthal and is in the April 2015 issue of American Patchwork and Quilting. The fabric is all Bonnie and Camille for Moda, mostly Scrumptious. It finished at 64"x 64"
It has approximately 896 pieces. 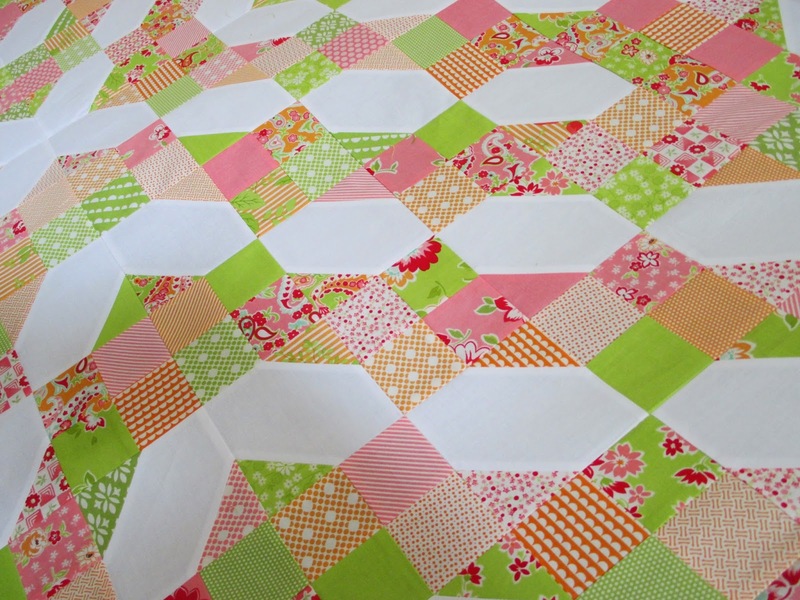 My favorite daughter has dibs on both my APQ Go Four It Quilts, they are definitely her colors. 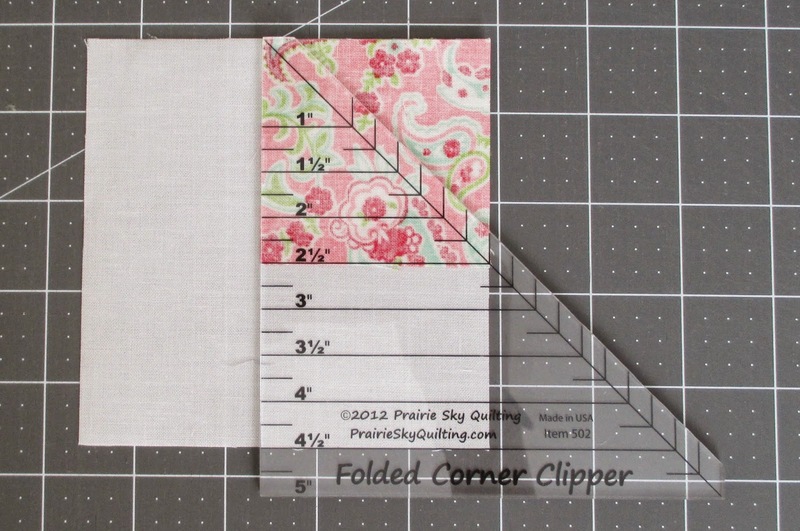 I also plan to make Edyta's pattern Scraptacular but am stumped on what fabric to use for the non 4 patch rows. I'm going to wait and see what some of you come up with, hopefully that will help me get it right the first time. 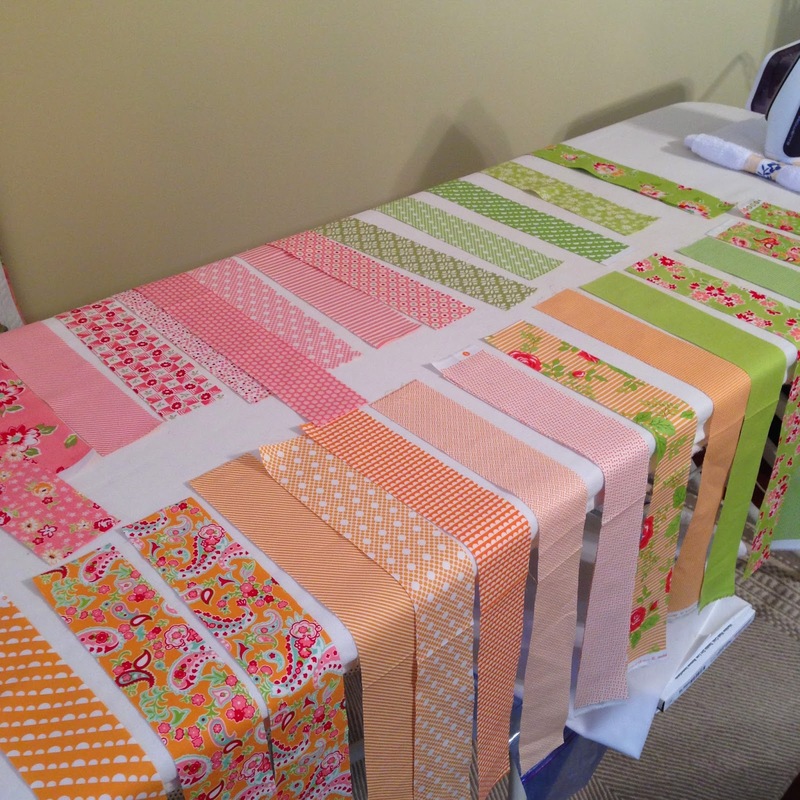 Barb, from Me and My Sisters Designs, is making Scraptacular out of her latest line Bandana by Moda. She is using a color palette that I love, and is working away on her 4 patches but has yet to reveal her solid row fabric, I'm eagerly watching. If you spy a great Scraptacular be sure to let me know. As I mentioned in my last blog post, out of the three 4 patch patterns available in the magazine, I decided to use the Rainbow Rows pattern by Lissa Alexander and go with the alternate color option project which is a wall hanging. And this is what I got. I thought this looked a little on the busy side and also thought perhaps going with a lap size instead of a wall hanging size would improve things. Which got me this. I'm not saying I don't like this layout or my fabric choices, but I am saying it doesn't look like I thought it would. So I've decided to think about these blocks and try a different pattern. This is Buried Treasure by April Rosenthal. 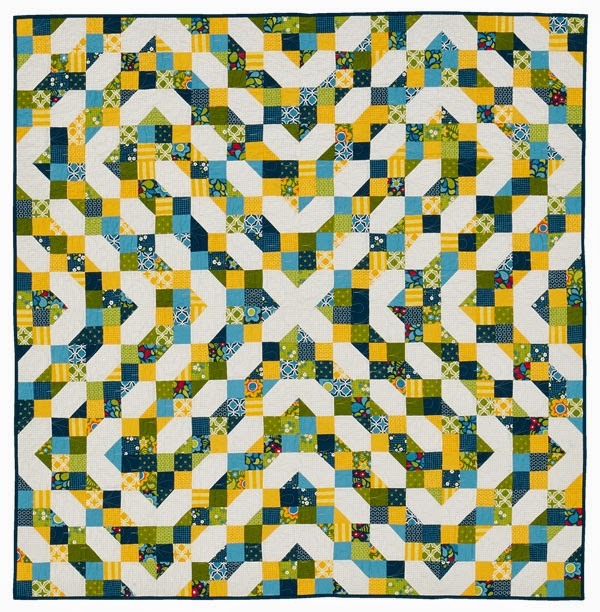 The magazine lists the skill level as intermediate, but I believe the blocks are very easy and think a confident beginner would have no trouble piecing this quilt. Since I thought my first sew along effort was on the busy side, I decided to stick with just three colors for my Buried Treasure, just like the pattern, even though I was really tempted to add some yellow, grey and turquoise to my pink, orange and green. I think all these fabrics are by Bonnie and Camille for Moda. 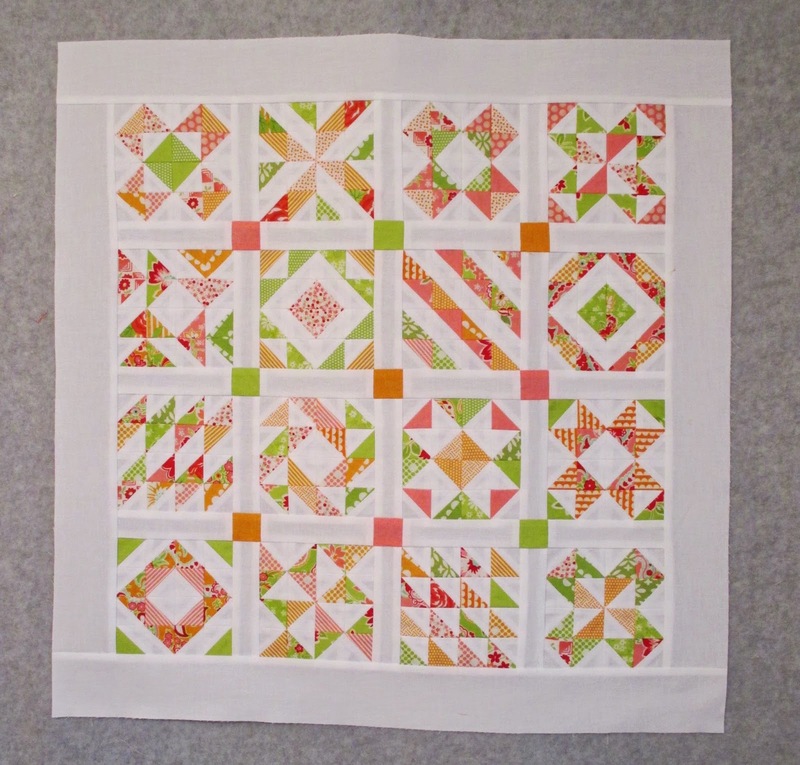 I'm feeling better about this pattern, the blocks are going together perfectly and the colors are very cheery. I think I just may be a white background kind of girl. The pattern calls for cutting squares to piece the 4 patches but I made strip sets instead, my 4 patch blocks are more accurate whenever I go with strip sets. One thing that helps me piece the Floating Star blocks is the Folded Corner Clipper template. And see that little triangle bonus block that is cut? I've been running those through my machine the same time I sew that block. I also press them while I'm pressing the Floating Star blocks. I'm not the only person working on these projects, check out the links below for more inspiration. 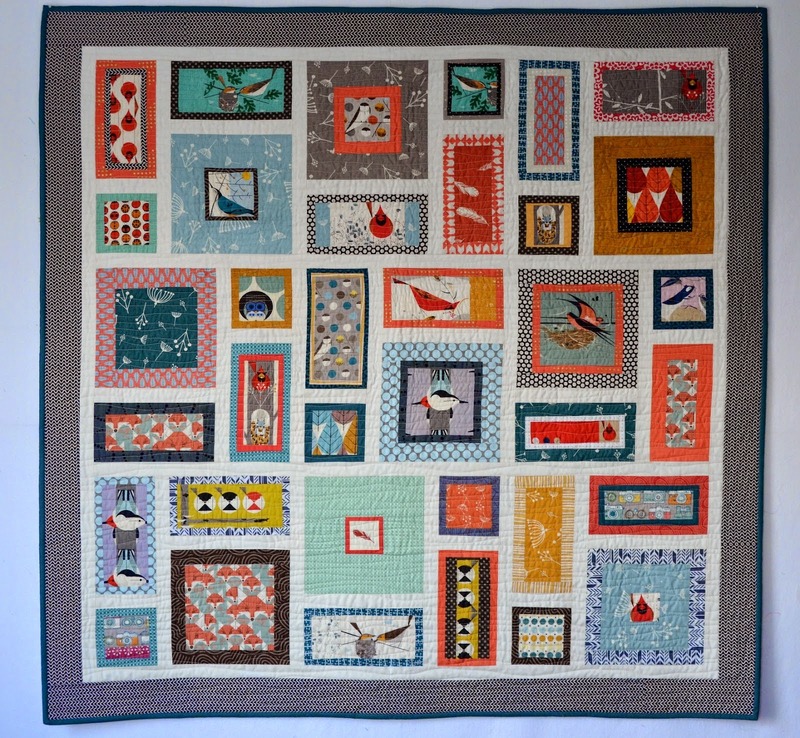 There's also inspiration on instagram using #apqquiltalong. If you're working on one of these patterns please send me a link to your blog or pictures via email, I love seeing all the different ideas for these patterns and you may be just the inspiration someone else needs to join the fun.